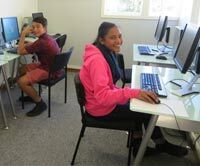 Oncore Youth Centre in Tauranga recently received a pod of six Transpower computers via the Computers in Homes programme. Transpower has an agreement with Remarkit where we donate retired IT stock to them to refurbish. Any equipment that cannot be refurbished is recycled. Useable equipment is on sold to the public and a proportion is provided free to community groups, with the majority of the stock going to Computers in Homes. Computers in Homes is a nationwide programme that brings computer technology within reach of all New Zealand families with school aged children. The programme focuses on educating parents of children from low decile schools. Parents complete a (free) 10 week course, and upon graduation they receive a recycled computer, 6 month's internet connection (with filtering, where available), and 12 months technical support. The programme is part-funded by the Ministry of Education and the Department of Internal Affairs, but still relies on support from the private sector.